SRS components are located in this area. 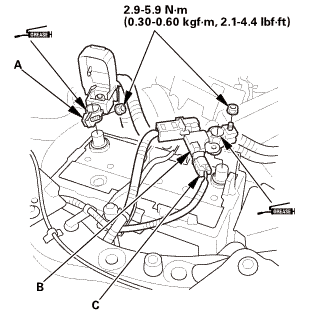 Review the SRS component locations and the precautions and procedures before doing repairs or service. 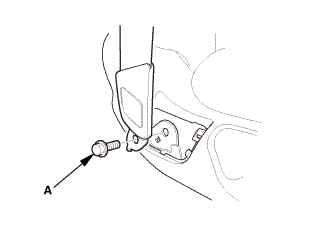 Disconnect and isolate the negative cable with the battery sensor (A) from the battery. Always disconnect the negative side first. 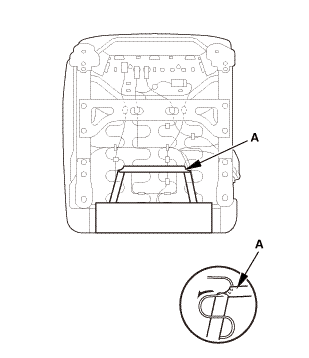 To protect the battery sensor connector (B) from damage, do not hold it when removing the negative terminal. Do not disconnect the battery sensor from the negative terminal (C). 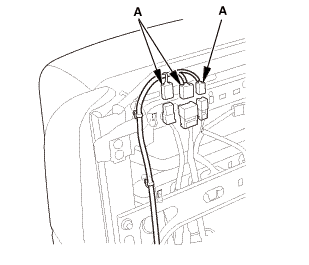 Disconnect the positive cable (D) from the battery. Wait at least 3 minutes before starting work. 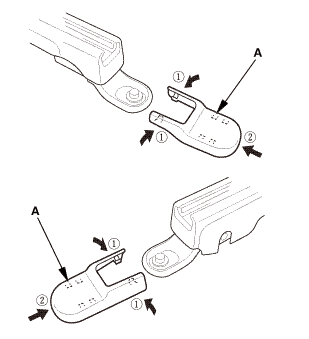 Remove the lower anchor bolt (A). 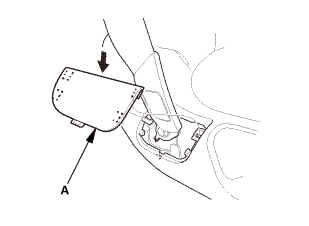 Remove the anchor cover (A). Remove the head restraint (A). 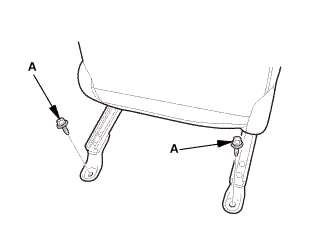 Remove both seat track end covers (A). 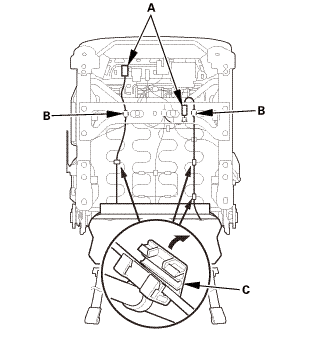 Remove the seat mounting front bolts (A). Remove the seat mounting rear bolts (A). 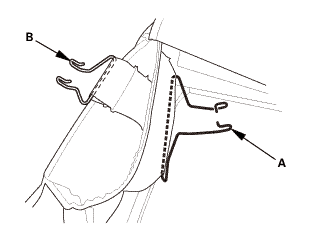 Detach the harness clips (B). 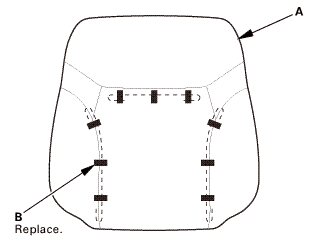 Unzip the seat-back cover (A). Release the hook strip (B). Release the hook strips (A). 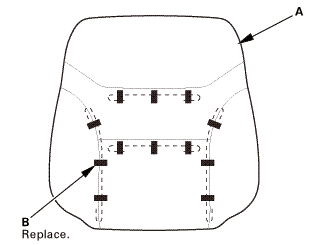 Detach the harness clips (A). Pull out the harness (B). 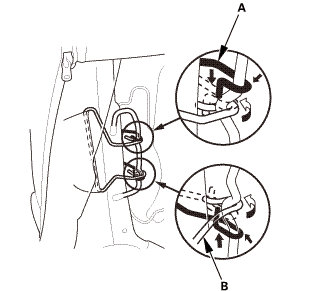 Release airbag attachment wires A and B. For some models: Remove the cover (A). 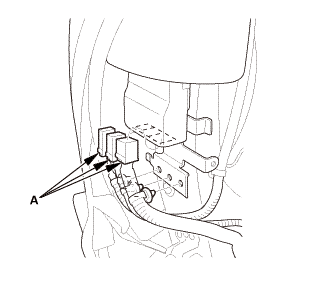 For some models: Disconnect the connectors (A). 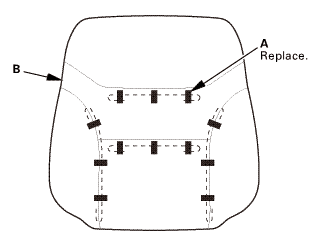 Remove the head restraint guides (A). 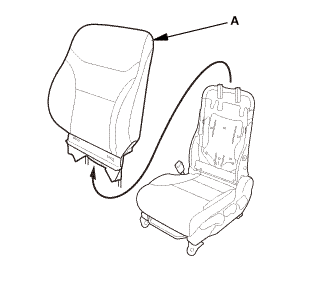 Remove the seat-back cover/pad (A). Remove the upholstery rings (A). 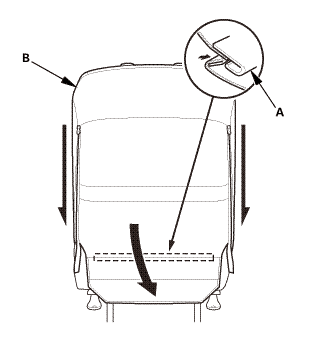 Remove the seat-back cover (B). 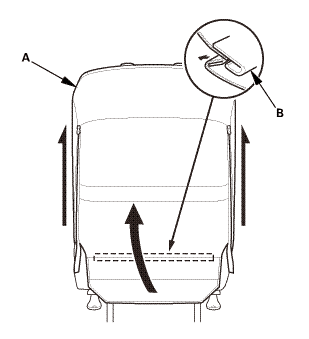 Remove the airbag attachment wires A and B. 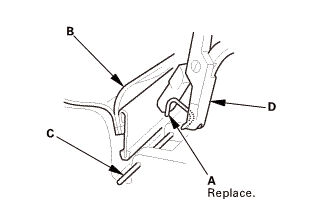 NOTE: Replace all of the upholstery rings (A) fastening the seat cushion cover (B) to the pad wires (C) with new ones using commercially available upholstery ring pliers (D). 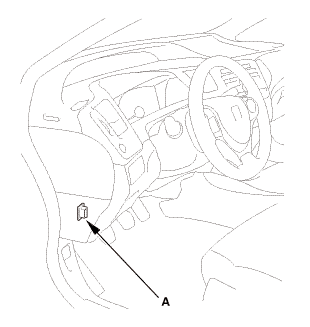 Install the airbag attachment wires A and B. 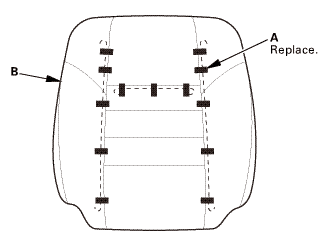 Install the seat-back cover (A) with the upholstery rings (B). 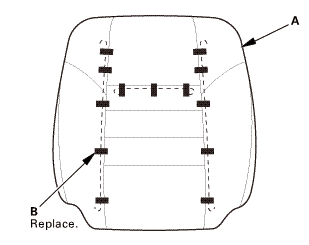 Install the seat-back cover/pad (A). 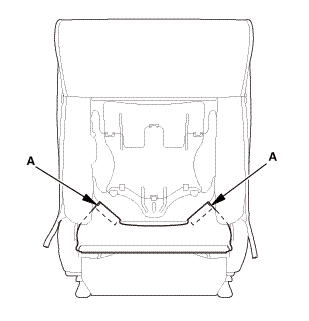 Install the head restraint guides (A). 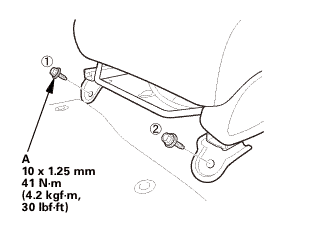 Install the harness clips (B). 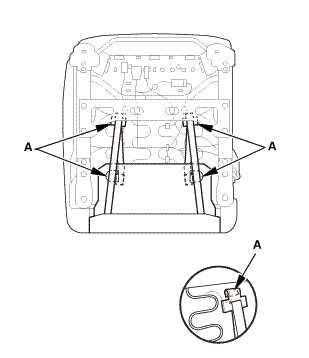 For some models: Connect the connectors (A). For some models: Install the cover (A). 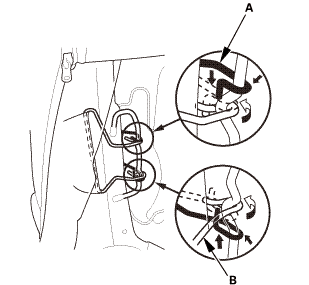 Install airbag attachment wires A and B. 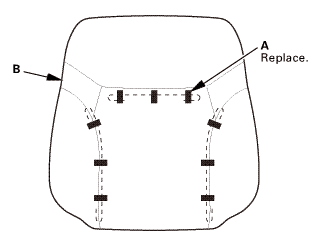 Install the harness (A) through the hole (B). Install the harness clip (C). 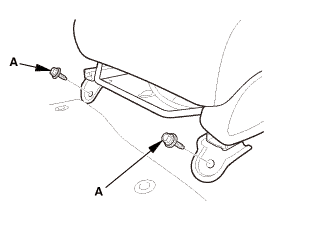 Install the hook strips (A). 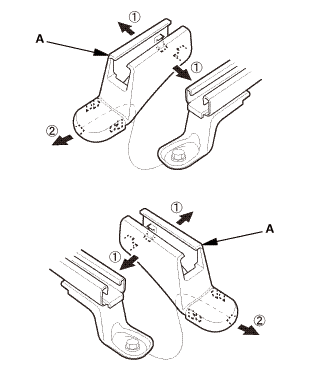 Install the hook strip (A). Zip the seat-back cover (B). Install the connector clip (A). 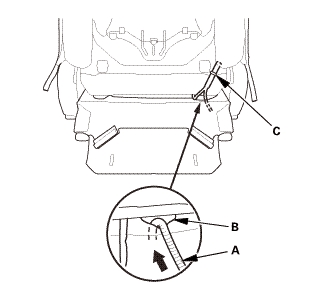 Install the harness clip (B). 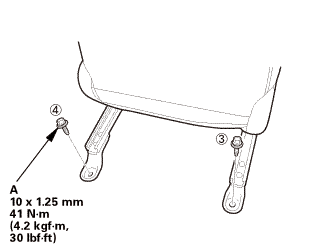 Install the seat mounting bolts (A). 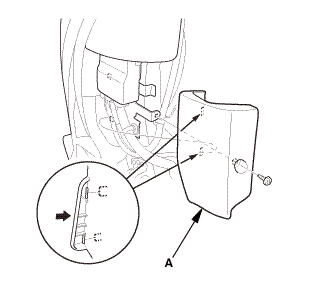 Tighten the bolts by hand first, then tighten them to specified torque. 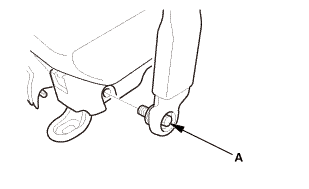 Tighten the seat mounting bolts to the specified torque in the sequence shown. 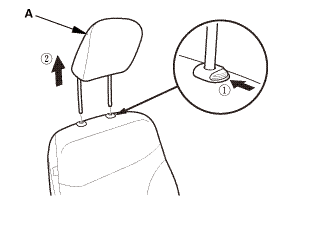 Slide the seat all the way back and tighten 1 and 2, then slide it forward and tighten 3 and 4. Install both seat track end covers (A). Install the head restraint (A). 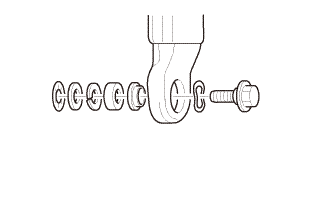 Assemble the washer, the collar, and the bushing on the lower anchor bolt as shown. 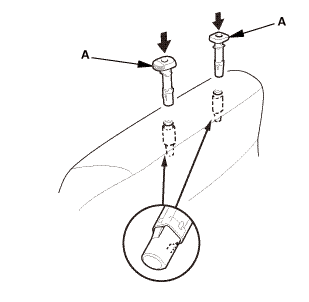 NOTE: Apply medium strength liquid thread lock to the lower anchor bolt before reinstallation. 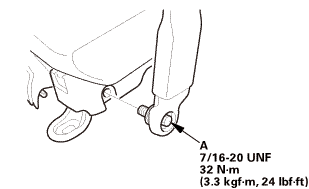 Install the lower anchor bolt (A). 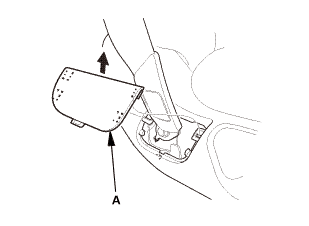 Install the anchor cover (A). NOTE: If the battery performs abnormally, test the battery. Connect the positive cable (A) to the battery. NOTE: Always connect the positive side first. Connect the negative cable and the battery sensor (B) to the battery. NOTE: To protect the battery sensor connector (C) from damage, do not hold it when installing the negative terminal. 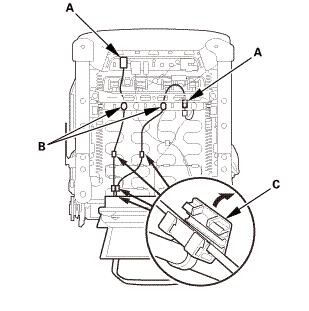 Apply multipurpose grease to the terminals to prevent corrosion. Connect the HDS to the data link connector (DLC) (A) located under the driver's side of the dashboard. Make sure the HDS communicates with the vehicle. 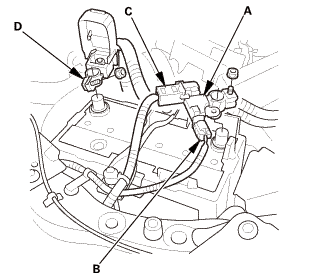 If it does not communicate, go to the DLC circuit troubleshooting. Clear the DTC(s) by following the screen prompts on the HDS. Turn the ignition switch to LOCK (0), then wait for 10 seconds. 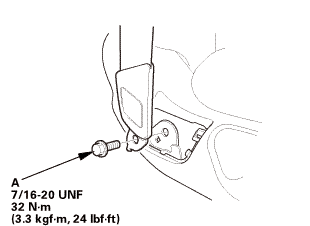 When you replace the front passenger's seat-back cover/pad, the SRS unit, and/or the ODS unit, initialize the OPDS sensor with the HDS. Before initializing the ODS unit, make sure the battery is fully charged. A new (uninitialized) ODS unit installed with a faulty OPDS sensor (DTC 86-1x or 86-2x) can cause DTCs 85-71 and 85-78. If the SRS has a hard DTC 86-1x or 86-2x, troubleshoot the DTCs completely before replacing the ODS unit. 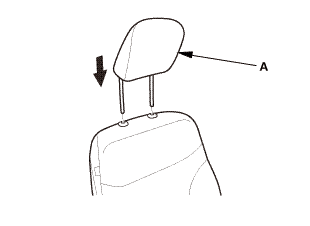 Make sure all components of the front passenger's seat are correctly installed. 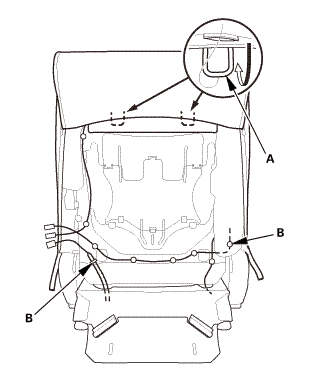 Dehumidify inside of the vehicle with A/C. Set the seat-back in a normal position. From the HDS Main Menu, select SRS, then INITIALIZATION. In the INITIALIZATION Menu, select ODS Initialization. Follow the prompts until the OPDS sensor initialization has been completed. NOTE: If the ODS unit fails to initialize after several attempts, replace the seat-back cover/pad equipped with an OPDS sensor, and retry. If the ODS unit continues to fail to initialize, replace the ODS unit.